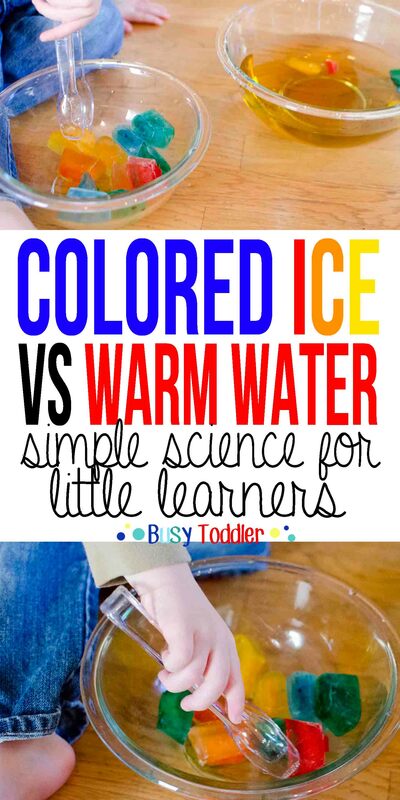 Colored Ice Transfer: A simple toddler science experiment. Colored ice transfer is one of our favorite toddler activities around here. It’s quick to set up and my tot learns to much from it. I pretty much always have colored ice on hand just for activity whims like this. Having a tray in the freezer is an easy activity supply to have around. Our colored ice transfers was so simple but was just plain awesome. And easy. 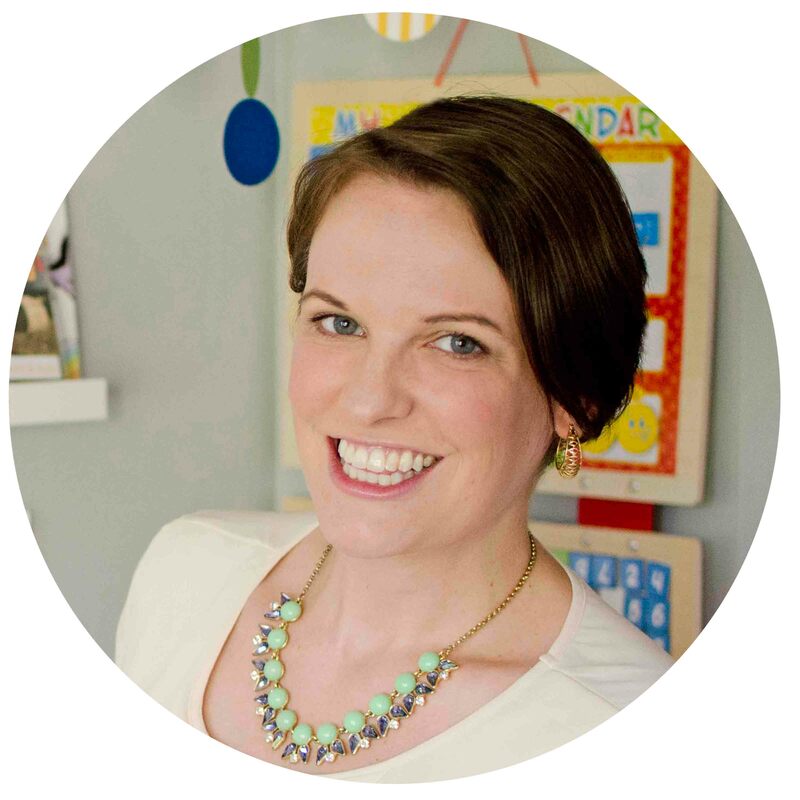 Awesome and easy toddler activities… now that’s a book I’d read cover to cover. 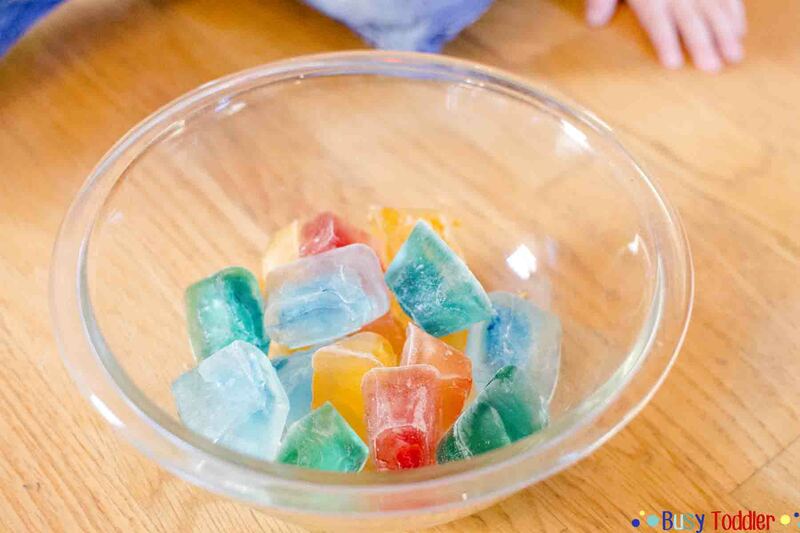 First, make yourself a batch of colored ice cubes. We have been on a colored ice kick lately, so we were out and had to make a fresh batch the night before. Sam and I did this together and that was fun in and of itself. Since he had helped to set up the project suddenly he had so much buy-in to this activity. He was so jazzed to see the ice cubes he’d made that it was like Christmas the next morning. Doing an activity with them was not a hard sell. I dumped all the cubes into a bowl and set a second bowl next to them filled with warm water. 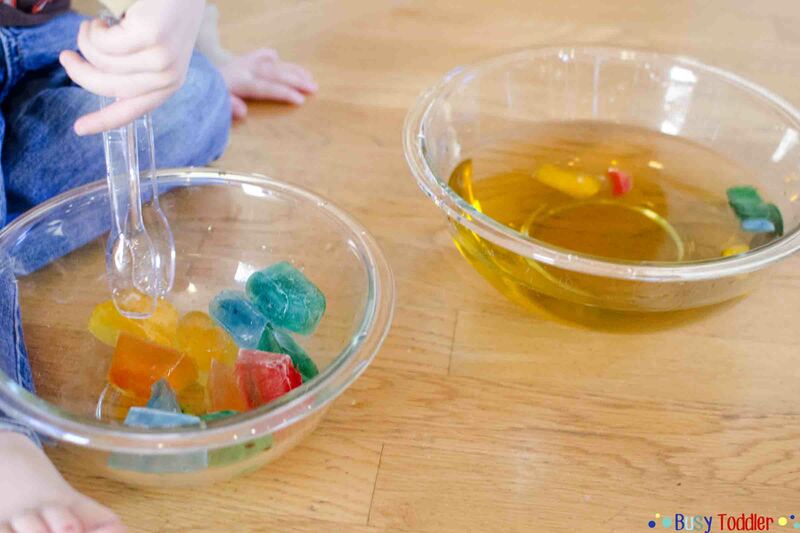 This might not scream science experiment, but trust me: this is science for toddlers and it’s awesome. 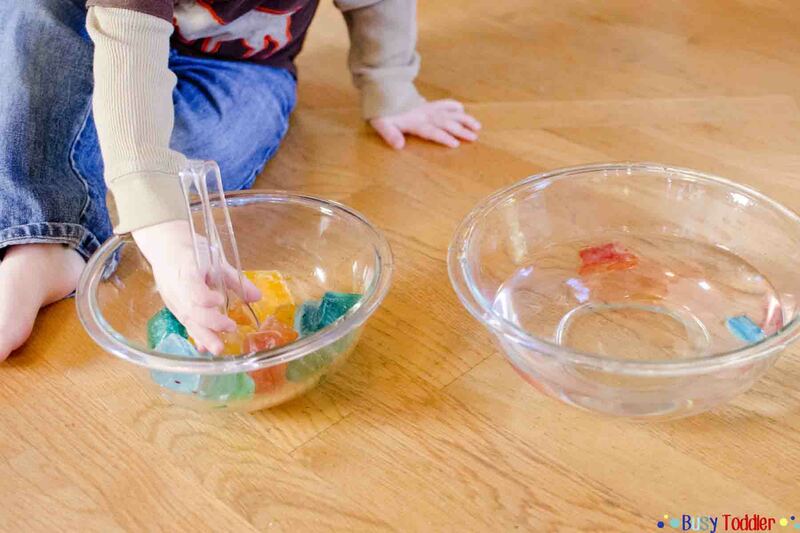 Sam used our favorite plastic tongs to grab the cubes one by one (fine motor skills) and drop them into the warm water. Then, he’d observe (ooohing and aaahing the whole time) as they got smaller. I definitely threw out a few vocabulary words like “solid”, “liquid”, and “dissolve” as he did the project. I don’t expect him to be able to have those memorized or even concretely understand them, but I can expose him to the terms and someday – someday he will get it. 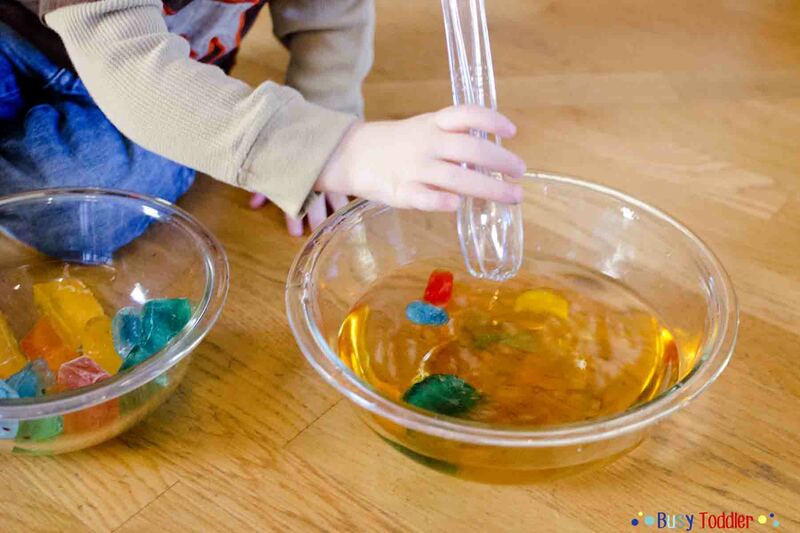 For this day and this toddler activity, he had so much fun working on his fine motor skills with the tongs and transferring the ice to the warm water. I did have to get fresh warm water about half way through the activity. 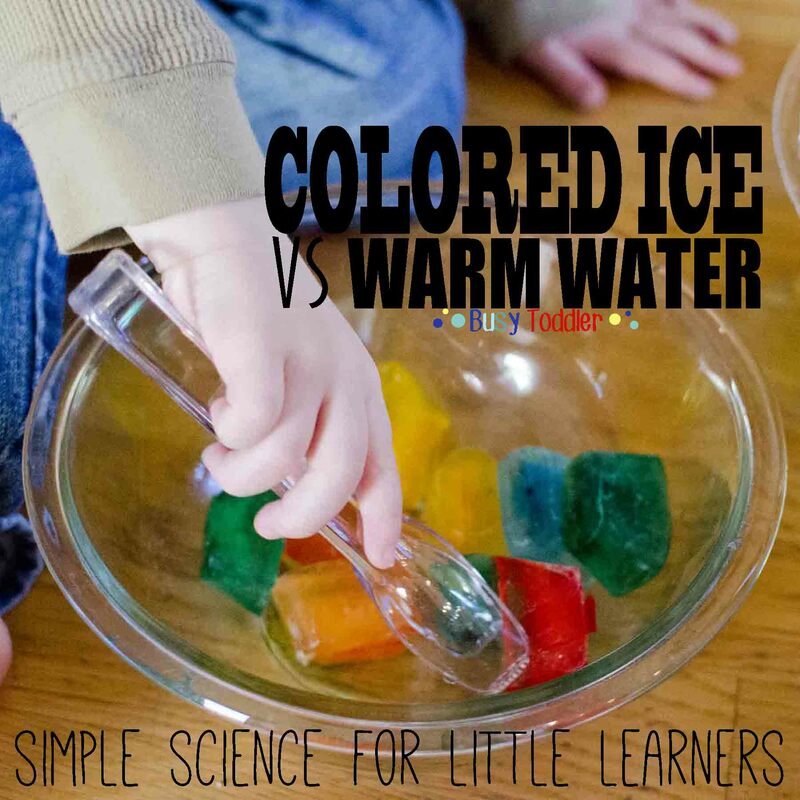 This toddler science experiment went so well for us and (of course) I refilled my ice cube trays at the end so we’d be ready for another ice activity some day in the future. You can never have too much toddler + ice in your life. 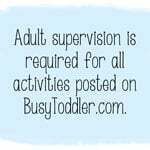 What a winner of a toddler activity: it’s a science experiment, it’s an exercise in fine motor skills, and it’s just good ol’ fun. 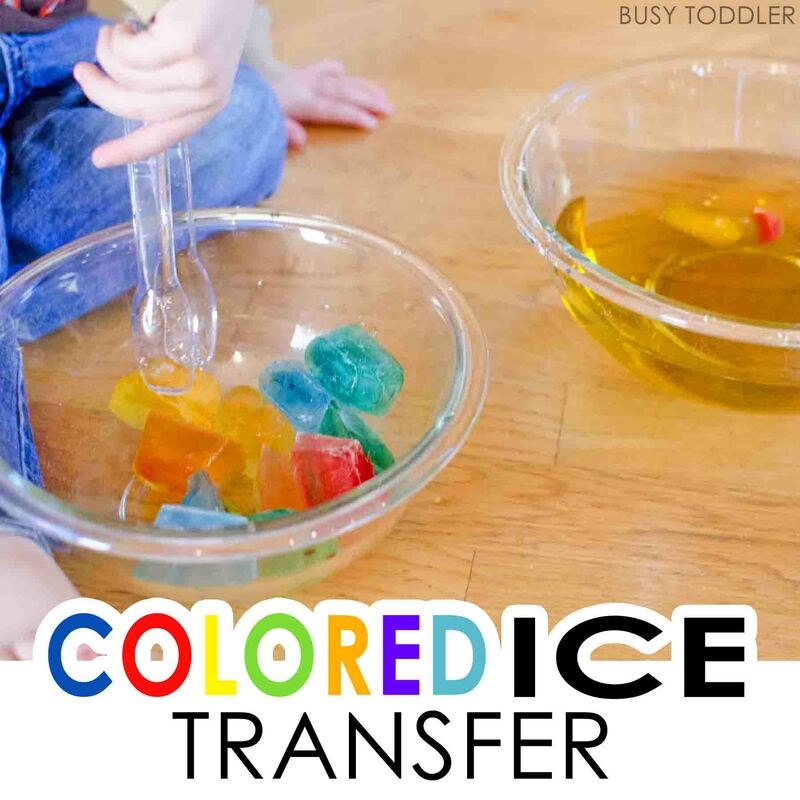 Have you played colored ice transfer at your house?